The best U.S. Open ever? WOW! What a U.S. Open! Two surprise winners and lots of talking points. I’ll get to the Serena saga in just a minute, but first – did anyone really think that Kim Clijsters would win the tournament? I didn’t. 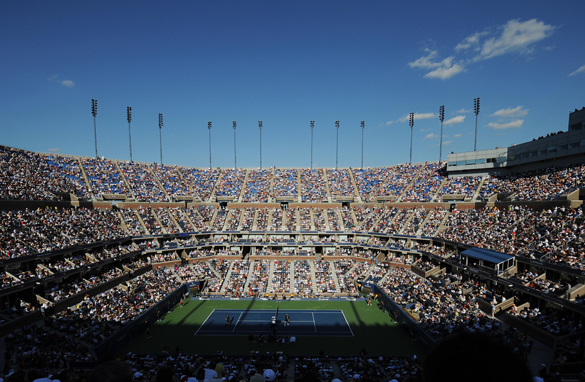 Roger Federer and Juan Martin Del Potro do battle for the U.S. Open title in the cauldron of the Arthur Ashe stadium. It was only her third tournament back since she began her “second career” and she was not only unseeded, but also without rank. So, she becomes the first female wild card to win a grand slam title and the first mother to win a major since 1980 – and wasn’t that celebration great? A real family affair with her adorable daughter Jada coming on the court to enjoy the moment. In my last post I addressed the issue of the lack of depth in the women’s game. But again, I don’t believe the standard has gone down, just that Clijsters is back and better than ever. She played more aggressively in New York than she has in the past and of course has nothing to lose. Every moment she has out on court is a bonus. There are more grand slams in her. It’s just a matter of whether she wants to stick around for a while. Juan Martin del Porto will win more majors. That I can promise you. The 20-year-old has now fulfilled his massive potential by winning the US Open, and could easily climb to the top of the rankings next year, if he can stay injury-free. Even when he was a break down in the fifth set though, I still thought King Roger would capture number 16. On a 40 match-winning streak at Flushing Meadows and with a sixth straight Open title in his sights, he let the match slip from his grasp in a quite an un-Federer-like display. But all credit to del Potro who thrashed Rafael Nadal in straight sets in the semi’s before dethroning the king in his very first grand slam final. Roger was his usual classy self afterward and after a pretty miserable start to the year, really finished well. Now, with twin girls I’m sure he’ll put this loss in perspective and not be too disheartened. He had a slight Serena moment in the final, swearing at the umpire – but it was nothing compared to the foul-mouthed rant at the line judge that we saw on Friday. It looked at first as though Serena had accepted the call, but then suddenly a switch flipped in her head and she lost it. I’m glad she’s now apologized because that post-match press conference was ridiculous. It might also save her from having her singles prize money taken away – $350, 000 and being banned from the tour.